In this Sept. 14, 2018, photo, empty shelves, normally stocked with strawberry punnets, are seen at a Coles Supermarket in Brisbane. Public fears about sewing needles concealed inside strawberries (see inset) on supermarket shelves have spread across Australia and New Zealand as growers turn to metal detectors and the Australian government launches an investigation to restore confidence in the popular fruit. 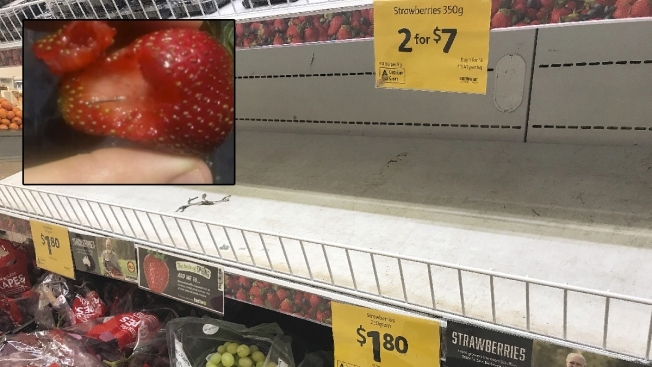 Public fears about sewing needles concealed inside strawberries on supermarket shelves have spread across Australia and New Zealand as growers turn to metal detectors and the Australian government launches an investigation to restore public confidence in the popular fruit. The government of Queensland state, where the contamination scare started last week, offered a 100,000 Australian dollar ($72,000) reward for information leading to the arrest of the person responsible for inserting needles into strawberries after six brands — Donnybrook Berries, Love Berry, Delightful Strawberries, Oasis, Berry Obsession and Berry Licious — were recalled. The scare had spread across the nation by Monday, with needles reported found in strawberries in all six Australian states. No injuries have been reported. Federal Health Minister Greg Hunt ordered the national food safety watchdog to investigate Queensland's handling of the needle scare. He directed Food Standards Australia New Zealand to investigate whether there are supply chain weaknesses that need to be fixed. "The job is very, very clear. Protect the public and keep them safe," Hunt told Australian Broadcasting Corp. Both of New Zealand's major food distributors, Foodstuffs and Countdown, announced on Monday they are taking Australian strawberries off their shelves because of the scare. New Zealand imports Australian strawberries when they are out of season locally from April to September, and both chains say the home-grown product will be on supermarket shelves soon. Queensland Strawberry Growers Association vice president Adrian Schultz said what had started as a single act of "commercial terrorism" had brought a multimillion-dollar industry to its knees. "I'm angry for all the associated people, it's the farmers, the people who supply them, the packaging people, the truckies with families to support, who suddenly lose their jobs ... it's far-reaching," Schultz said. Major Australian supermarket chains Coles and Aldi have pulled all strawberries from their shelves across Australia except in Western Australia state as a precaution. But Western Australia police announced Monday that the first suspected needle contamination case has been reported in locally grown fruit. A man in the town of York reported to police that he found a needle in a sink after washing strawberries. The report came after a 7-year-old girl in South Australia state found a needle in a Western Australia-grown strawberry on Saturday. Western Australia Health Minister Roger Cook said the needle could have been inserted in the fruit after it arrived in South Australia. Strawberry Growers Association of Western Australia president Neil Handasyde said growers had received requests from major retailers and insurance companies to scan fruit for needles. "As an industry we are sure that (the needles) are not coming from the farm, but we're trying to get confidence into consumers that when they buy ... strawberries, that there isn't going to be anything other than strawberries in there and they're safe to eat," Handasyde told ABC. "Industry are looking at lots of different ways of tackling this issue. There's been metal detectors purchased and tamper-proof packaging looked at," he said. Handasyde said he paid AU$20,000 for a metal detector for his berry farm.